Mount Rainier’s wildflower displays are world renown. Pinks, purples, blues, yellows seemingly every hue of the color spectrum are represented in awe-inspiring displays. From an up-close look at a delicate glacier lily, to the Dr. Seuss Bear Grass to expansive fields of purple lupine and deep red paintbrush, experiencing Mt. Rainier’s wildflowers is worthy of trip to Mount Rainier alone. 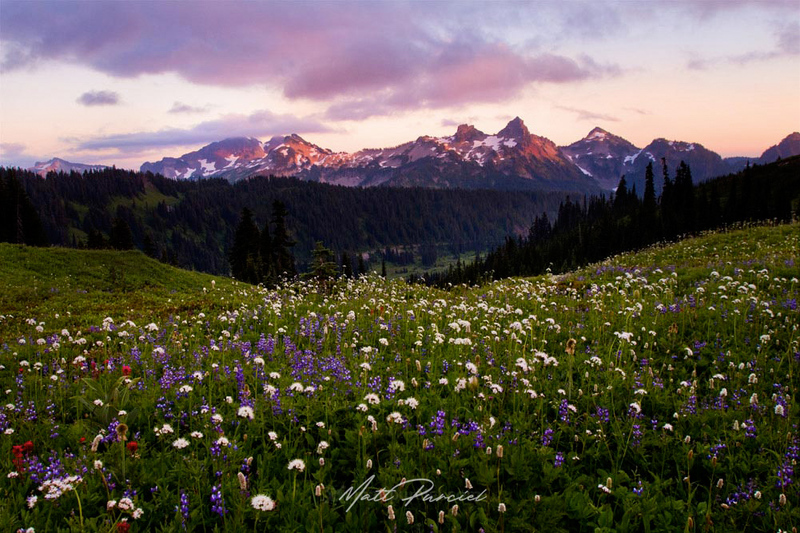 That evening we hiked to Paradise Meadow while enjoying the summer air and Mount Rainier wildflowers. The sunset light was illuminating the craggy Tatoosh Range so I opted for a composition with the amazing plethora of wildflower as a foreground. All material © copyright by Matt Purciel. All rights reserved.